It’s Friday afternoon, meetings are wrapping up, the inbox has been cleaned out a touch, and let’s be honest: Your productivity from now until the end of the day is going to be garbage, as you alternately check social media and see what times Deadpool 2 is playing this weekend, all while the low-level ennui constituting modern existence smolders beneath the surface of your seemingly benumbed exterior. 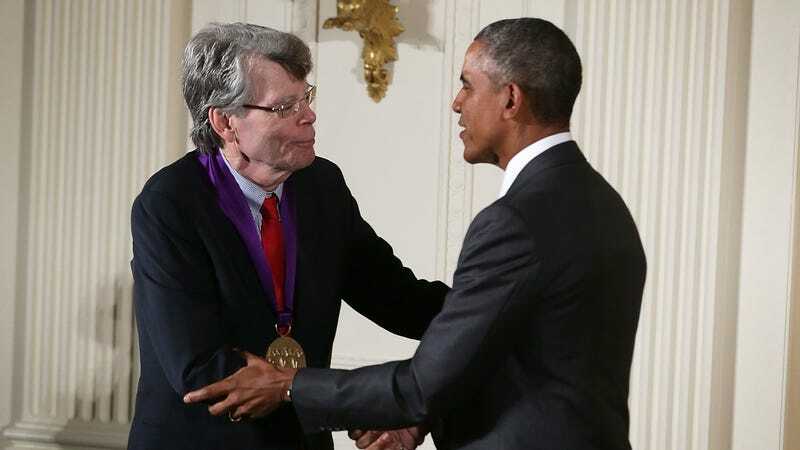 Sounds like a damn fine time to read a little Stephen King. And you’re in luck, because the Robert Pollard of horror fiction has just released a new short story, available for free, on his website. Clocking in at a satisfyingly fleet 32 pages (double-spaced, because King is a good student who follows the rules), “Laurie” is the tale of a sister trying to give a shelter-bound dog to her brother, who just lost his wife of 40 years six months earlier. Or, at least, that’s how it starts—we’re a little nervous to keep reading, just in case anything happens to this lovable little mutt. As always, we’ll be deeply relieved if the dog ends up lying in the kitchen nibbling happily on a chew toy, while her potential new owner gets vivisected twelve ways from Sunday. Well, there you go. An ironclad case. No need to read any further. Enjoy this Friday—and look, another 90 seconds have passed since you first clicked on this! Surely the boss won’t notice if you leave a little early.